Large military institutions are often portrayed as being inherently conservative and having a tendency to cope poorly with innovation. However, since some such challenges have been handled highly effectively, this knee-jerk assumption is clearly inaccurate. Moreover, it leaves open an interesting question: how can we explain the discrepancy between successful and unsuccessful adaptation to change? Why is it that an army or navy that responds extremely effectively to one challenge can fail to cope with another? It is this question that Gautam Mukunda seeks to address using a body of theory borrowed from business studies. The result is an article that is an interesting and rewarding read, which adds to an understanding of both naval warfare in the First World War and also the process of coping with innovation. There are many aspects to commend and also a few areas where the theory might usefully be further developed. 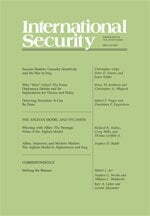 It may be useful to mark the addition of Security Studies to the H-Diplo list by discussing some of the differences in the way historians and political scientists typically approach our common subject matter. Is it too much to say that our relations are symbiotic or even that we are doomed to a marriage? Although we have significant differences and often squabble, we not only need to stay together for the sake of the kids (i.e., our students), but while we sometimes do not want to acknowledge it, we draw great sustenance and even pleasure from each other. From the political science side, it seems to me that the investment and affections are a bit asymmetric in that most of us see the great importance of international history, while historians draw less from political science and sometimes have the temerity to doubt the value of the discipline. In my last year of graduate studies at Berkeley I took a fine course on European international history by the renowned Raymond Sontag. I very much enjoyed and learned from the course, but when I talked to him about drawing on history for my dissertation, while he treated me with great personal kindness, he made clear that he really didn’t see why political science was needed and hoped that I would not muck up his field. On the other hand, many historians have not only tolerated and even encouraged our intrusions, they have drawn on our theories. For all our differences, we share a fascination with the patterns, idiosyncrasies, and changes in cross-border relations.